Along with the perhaps showier forbs (wildflowers), spring is also a good time to observe ferns and fern allies, which are finally emerging from this years particularly long winter dormancy. If you are hunting for fiddle-heads, now is a good time to do it! Bracken and ostrich ferns are now uncurling their little heads, forming new fronds. The old classification Pteridophyta (ferns and fern allieswhich includes lycopods, Equisetum, Psilotaceae, and the true ferns) contains the vascular cryptograms: those plants with true vascular (conducting) tissue and structures, but without seeds or flowersrather, they form spores. Not all of these groups are closely related, however. Recent molecular studies have shown that the lycopods are much older than the others, for instance. Also, pteridophytes were once thought to represent the first land plants, due to their abundance in the early fossil record, but more evidence has overturned this view. Today there is little doubt that the first land plants were bryophytes (liverworts, mosses, or hornworts). Ferns and fern allies (more accurately termed monilophytes) are an ancient group of plants, dating back to the middle Devonian period, 380 million years ago (mya). Compared to the oldest flowering plants in early Cretaceous, 144 mya, monilophytes are much older than flowering plants. The heyday of monilophytes could arguably have been the late Paleozoic Era, during the Carboniferous Period, when many thousands of species dominated the florasome had even evolved secondary meristematic tissue and attained the size of trees! Today they comprise over 11,000 species (much less than the roughly 300,000 species of flowering plants!). Ferns are interesting in that they spend most of their life cycle in the sporophyte generation (that which produces spores). The gametophyte generation (that which produce gametesmale and female) is very reduced and short. A more ancestral trait of ferns is for the gametophyte to actually be subterranean (hidden underground). Contrast this with flowering plants, which have gone down an opposite road, evolutionarily speaking, and spend the great bulk of their lives producing gametes, while the sporophyte generation is greatly reduced. In Minnesota, fern habitats are most commonly in moist woodlands (e.g., Onoclea sensibilis, Adiantum pedatum), shorelines and riverbanks (e.g., Equisetum), marshes (e.g., Thelypteris palustris), limestone outcroppings along major waterways (e.g., Crystopteris bulbifera), and shaded sandstone (e.g., Dryopteris spp., Woodsia obtuse). Ferns and fern allies can also be found in drier areas like open woodlands (e.g., Pteridium aquilinum, Botrychium spp.). They also frequent bogs and can even be found in standing water (Azolla spp.). Also look for them in fields, railroad rights-of-way, and roadsides. One of the most common of fern-allies is the family Equisetaceae, the horsetails. There are only about 15 to 25 species of Equisetum in the world, yet just about wherever you go you it can be found. These distinctive little plants have stout rhizomes; erect, hollow, ridged, jointed stems; whorled branches and leaves; leaf sheaths; and sporangia borne in terminal cones or strobili. They are hard to mistake for anything else. To defend against herbivory and to provide structure to the stem, horsetails contain silica, which makes them very stiff and gritty. Historically, they were commonly used to scrub pans (hence the common name scouring rush) or to sand wood. Also, a tea called cola de caballo or shave grass is made from horsetail, which purports to strengthen bones and cartilage. One of the most common native species of Equisetum in North America and Minnesota is Equisetum arvense, or Common Horsetail. In early spring, this annual produces a short, brown stem that bears a large cone at its tip. Later in spring, it will send up several regularly branched, green, sterile stems that look like a horses tail. To find it, look for groups of many stems along roadsides near woodlands. 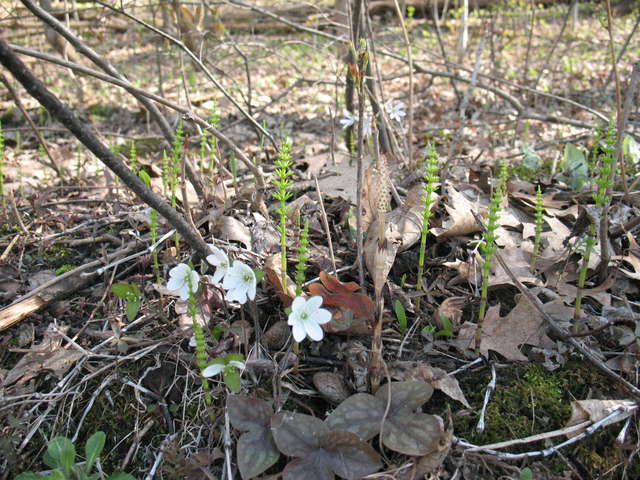 Recently, I saw lots of Equisetum arvense in the Hastings SNA, growing at the edge of the SNA, along State Highway 291, amongst spring ephemerals, like Virginia waterleaf, bloodroot, rue anemone, sharped-lobed hepatica, wild ginger, and early meadow rue. Although the same height as the forbs, against them, the horsetails looked strangerather like living fossils. Not surprising, since their family traces back to the late Devonian period, 354 mya! It pales in comparison, however, to its ancient relatives of the Carboniferous period, of the genus Calamitestrees that attained a height of 65 feet!